I love Scones. But I have to admit that I don’t enjoy the “cutting cold butter into small pea size” action that most traditional scone recipes ask for. That’s why I turned my heart and soul into searching for quick and easy cream biscuit recipes. Here is a good one that you can literally prep the whole thing in 5 minutes before you put into oven to bake. I came across this recipe by accident while I was looking for some good biscuit topping for my blueberry cobbler dessert. 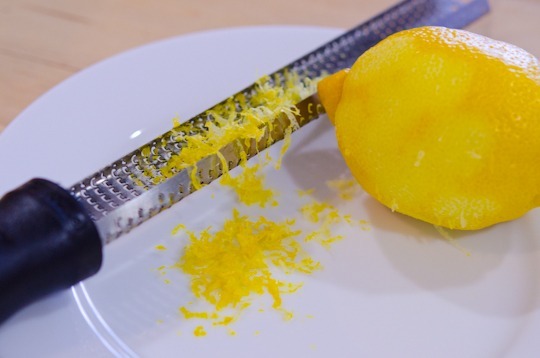 I adapted the recipe to add more lemony flavor by adding lemon zest and lemon extract. 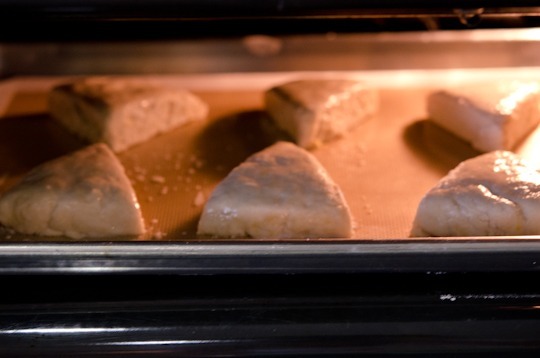 Other than that it is one of the simplest scone recipe you can make from scratch. By the way I might have fooled you by saying Lemonade Scones, which you don’t see any lemonade (in terms of American style lemonade drink) in the recipe. I learned that countries in the southern hemisphere call the “Sprite“, the Lemonade! Here are what you need. 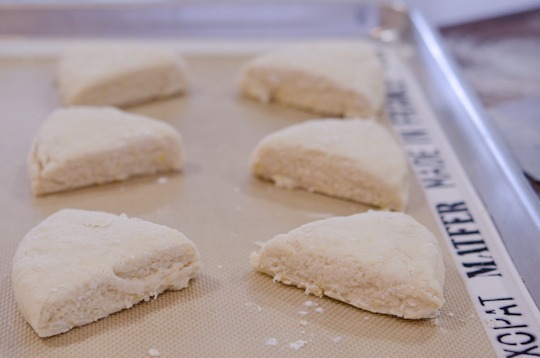 Self-rising flour is a great way to go for this kind of short bread. Sift flour, sugar, and salt in a mixing bowl. Measure 1/2 cup of Sprite, aka the *lemonade*. Pour over the flour mixture. You will see some serious foam. It’s all about gas! Add the cream and the lemon zest. Oh.., and a little bit of lemon extract if you have. Mix until JUST combined. 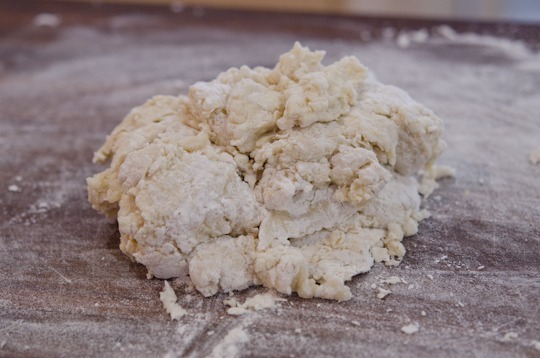 DO NOT over mix at this stage, … unless you want chewy scones, which I don’t think you would. 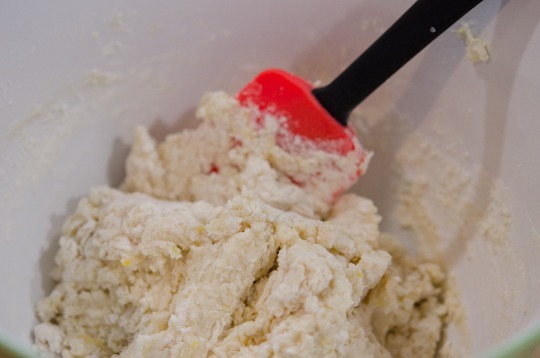 Dump the whole mess on to lightly floured surface anywhere in your kitchen. 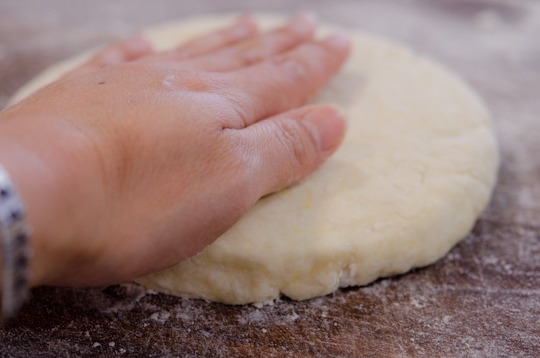 Bring the dough together and pat it down to make about 3/4″ thick disk shape, about 7″ in diameter, … just eyeball it. 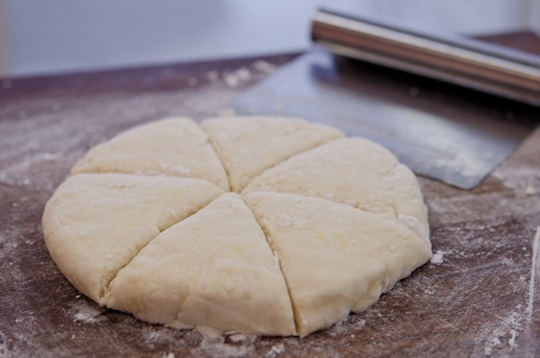 Cut into 6-8 wedges, or use a round biscuit cutter if you are one of those purists who think scones should be no other shape than round. Place on the pan lined with baking mat or parchment paper. Brush with milk to get a nice golden tan on top. witness the wonder of chemistry. They are rising! At that very moment I realized that *Rising* is a divine wonder. 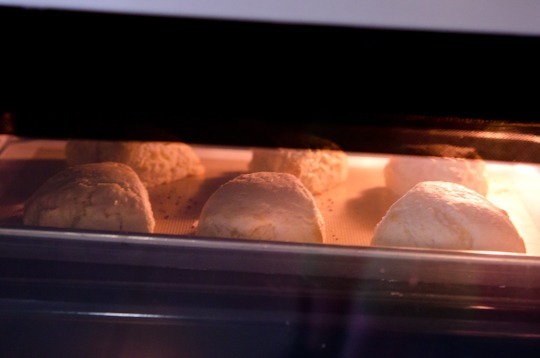 The rising sun…, the rising from the dead…, and the rising dough in your oven. How profound! Take them out when they look beautiful. Cool slightly before you transfer. Slobber with your favorite jam and shove it into your mouth when they are still warm. A cup of mint tea would add great elegance to your afternoon snack. I would be lying if I say these are the best scones you will ever taste. they are much better than I thought and you will love the subtle lemon flavor. No wonder the recipe got such a rave reviews at the site where I got it from. 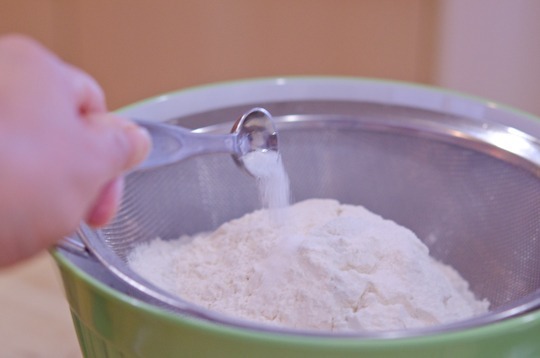 Sift flour, sugar and salt in a large mixing bowl. 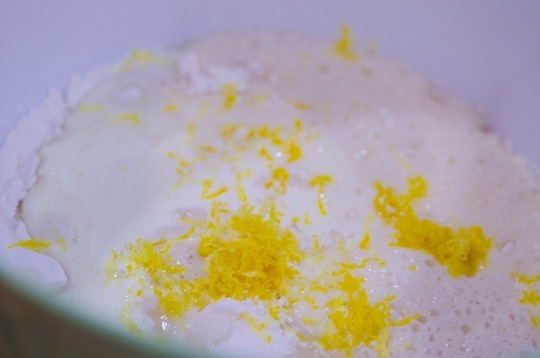 Add soda, cream, lemon zest and lemon extract, if using, in the bowl and mix until just combined. 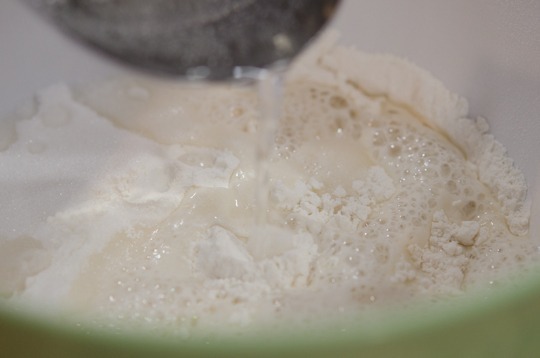 Turn out the mixture on the floured surface and bring together. Pat it down to make 3/4"thick disk, about 7" in diameter. Cut into 6-8 wedges or use a round biscuit cutter. 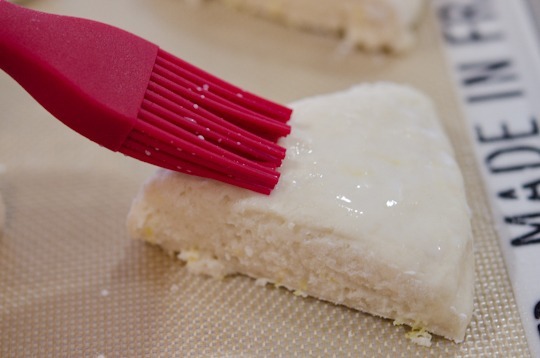 Place on the baking tray and brush with milk. Bake for 10-15 minutes until the top is golden. Serve warm with your favorite jam and whipped cream if you wish. Nice recipe. I think - although I'm not positive - that "lemonade" in Great Britain also mans Sprite (or 7-Up). I, too, hate that "small pea" thing with butter! I usually mix biscuit and pie dough in the food processor - it takes care of that, so I don't have to! I haven't tried scones in the food processor, though. Anyway, this is a pretty inventive recipe - love the inclusion of the "lemonade!" Fun recipe - thanks. I use food processor for my pie dough as well. I must be getting old for the cutting cold butter action. I used to be fine with that. 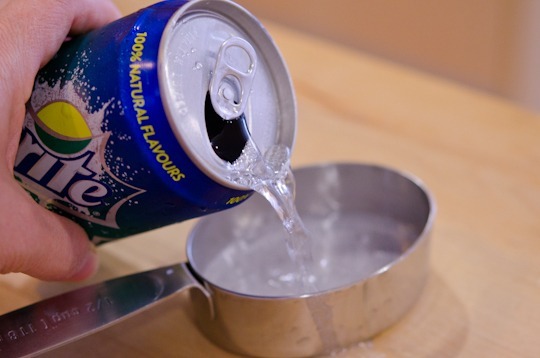 I found it quite interesting to learn about the sprite terminology as I discovered this recipe. I'm stunned! This is so easy to make. Although this may not be the best of best, but still it's easy to make and I'm sure it's better than scones from some stores. 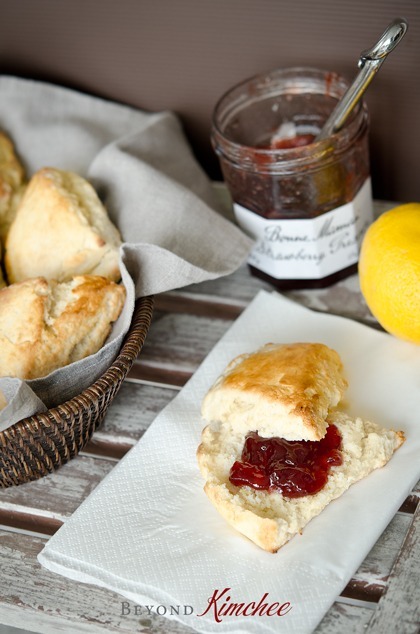 I love scones more than muffins or cupcakes and I'll keep this quick scone recipe for the future! 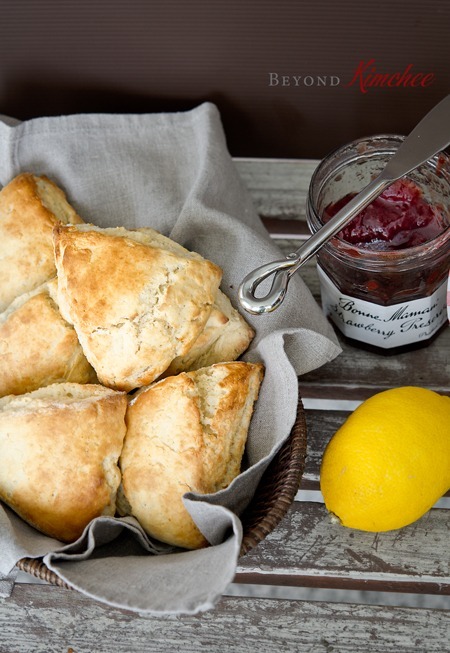 The texture of this scone is very nice and the flavor is good considering quick and easy type scones. 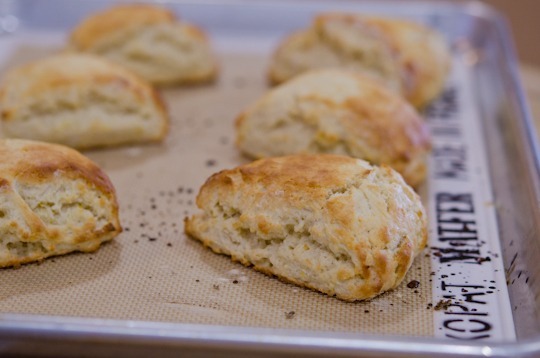 It perhaps won't be the best scone you have had, but will be easiest to make from scratch with a decent flavor. I liked it okay. 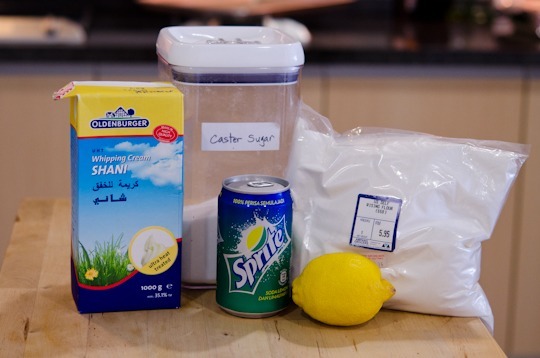 Ive never heard of adding soda to a bread recipe. Although I don't make it often enough to know it this sounds so easy and looks so pretty. Tell me though what was with the photo of the food where the directions say to dump the mixture anywhere? I missed something I think. 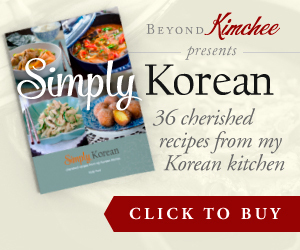 Nice recipe and pretty photos. Thanks Vivki. I meant to turn out the dough on to the floured cutting board or table, or wherever you like the dough to form together. 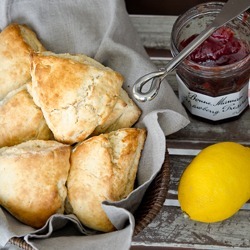 I like the whimsy of calling them lemonade scones - it's just fun! Here in the UK Sprite is a lemon/lime drink. Lemonade is just... lemon! Am totally intrigued by this - will have to try! Ha!ha! Holly, I love your words. "Slobber with your favorite jam" and "shove it in your mouth" because you speak like the way people want to eat! When there is something delicious to eat, I don't politely nip at it, I shove it in my mouth!! 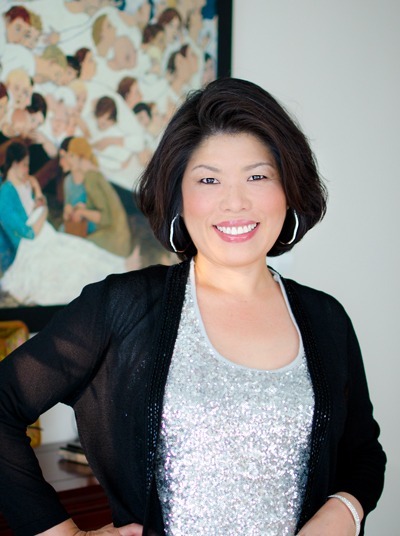 Good food is about a sensory experience- the smells, textures, tastes, and sound and sight. I never could understand people who eat like there is nothing special about food. You write the way I feel like eating when I read one of your recipes. I get a good laugh and a rumbly stomach at the same time! Thanks Lisa for the compliment. I am with you, when it comes to eat, I don't nip at it. Sensory experience is important part of enjoying food, thus make people who enjoy them happy. I am glad that my recipes make you laugh. Have a great day! Wow, these look perfect! I would never have thought to use Sprite in scones. Great scones was easy loved them I think the lemon zest made a good flavour. My husband really liked them. That is so great Debbie! I love the subtle lemon flavor in the scones. Glad to hear that your husband liked them.